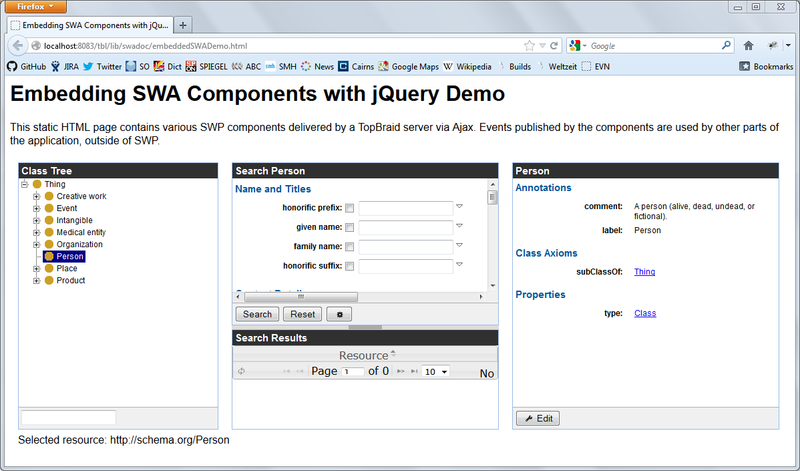 SPARQL Web Pages is a powerful framework for defining HTML renderings of RDF data. Recent releases of TopBraid have added significant improvements to this framework, including a growing library of out-of-the-box components for recurring tasks: the SWA Gadgets. 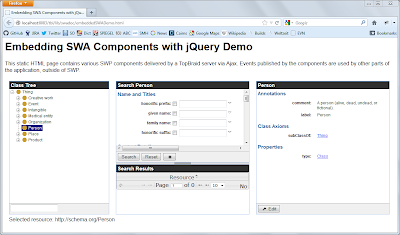 SWA includes components to display or edit details of a given resource, render hierarchies in trees, display a list of instances, provide a search form with various result viewers, faceted search etc. At TopQuadrant we are using these components in our own solutions, including EVN and customer projects. We are committed to keeping these components stable and alive and will continue to improve them. So TopBraid customers do not need to reinvent the wheel. You can try this out yourself if you start TopBraid Composer ME 4.3 and go to the URL in the browser above. Let's look at the source code of how this is done. Create a small script that tells SWA about the location of the SWP servlet and the default RDF graph. Insert a placeholder div element in the body of your document. Please take a look at the source code of the example above - in TopBraid Composer 4.3 it is found in TopBraid/SWA/doc/swadoc.www/embeddedSWADemo.html - and do not hesitate to ask questions and provide feature requests on our mailing list.